The annual National Press Festival 2019, themed “Renovated, creative, responsible Vietnamese press for the interests of the nation and people”, wrapped up in Hanoi on March 17. Speaking at the closing ceremony, permanent Vice Chairman of the Vietnamese Journalists’ Association (VJA) Ho Quang Loi said the event affirms the strong development of revolutionary Vietnamese press and reflects its responsibility for the country and people. Up to 200 exhibitors, including press agencies and journalists’ associations at all levels, joined the event. The organising board presented prizes in six types. There were 76 prizes for impressive stalls, 76 prizes for New Year cover pages, 20 prizes for interfaces, 43 prizes for impressive radio-television programmes for Lunar New Year holiday, and 23 prizes for scientific studies on press professionalism. The prizes on outstanding reportages on environment, climate change and disaster prevention were granted in many categories for printed publications, electronic newspapers, pictorial newspapers, televisions and radios. 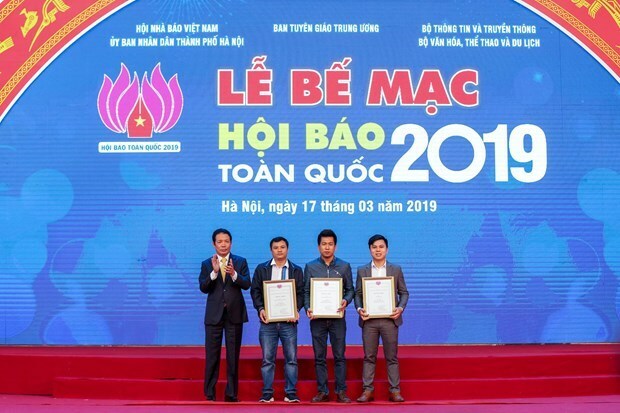 The Vietnam News Agency (VNA) won the A prize for impressive stall and another prize for impressive radio-television programme for Lunar New Year holiday. Its Tin Tuc and Vietnamplus newswires won prizes for their interface, while Tuan Tin Tuc (Weekly) won the prize for cover page for Lunar New Year holiday. The News Department for Domestic Service grabbed the B prize for outstanding reportage on environment, climate change, disaster prevention with the article “Ocean plastic waste – the global emergency issue” by Hoang Minh Nguyet. Meanwhile, Vietnamplus won the C prize with the news story “Crime under green forest” by Vo Manh Hung and Hoang Van Chien. Co-hosted by the Vietnam Journalists’ Association, the Party Central Committee’s Commission for Information and Education, the Ministry of Information and Communications (MIC), the Ministry of Culture, Sports and Tourism, and the municipal People’s Committee, the event displayed New Year publications, audio and television programmes, nearly 300 reportages on environment, climate change and disaster prevention, and over 80 articles on science and press professionalism. The festival also featured seminars on journalist Huynh Van Tieng, former VJA Vice Chairman, the press role in raising public awareness of behavioral culture, forums “Press – Bridge between businesses and government” and “Young journalists and training”. One of the highlights were displays “Most trusted news source” by VNA, “Press with outstanding events of the country” by the MIC, and “Nhan dan newspaper with Party building” by the paper. Press photo exhibitions were also held. On the occasion, the organising board also presented publications to soldiers in border and island areas.